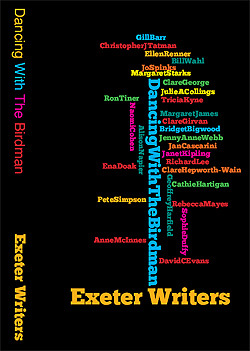 Dancing with the Birdman was launched on Saturday 13th November at Exeter Central Library and included short readings by each of the writers. The perils of piano lessons in later life, an allergy to blue and white plates and vengeful ghosts – just some of the surprising, entertaining and thought-provoking storylines examined in a new book which is a celebration of Exeter’s creativity. The collection is entitled Dancing with the Birdman, chosen from the submission by American screenplay writer Pete Simpson who now lives in Devon. Twenty eight writers aged from their 20’s to 90’s are represented in this book of stories, poems, plays and sketches. The collection marks the 60th anniversary of the Exeter Writers, a group which meets fortnightly with the aim of encouraging creative writing in all forms. Amongst the contributors are historical novelist Margaret James, whose 14th book The Silver Locket is also being published this month. There is also a story from teenagers’ writer Ellen Renner, author of Castle of Shadows, which received rave reviews in The Times. David Evans, author of the children’s book Thistledown Farm: Farmer John's Boots and other stories, has written a Farmer John story especially for the collection. Other contributors include Exeter University Writer in Residence Clare George, Yeovil Novel competition winner Sophie Duffy, and multiple short story and playwriting competition winner Clare Girvan. Cathie Hartigan, who teaches creative writing at Exeter College and helped put the anthology together, said: “We certainly have some star writers who’ve achieved critical acclaim. But the book contains pieces of exceptional quality by everyone. “The contributors come from a wide variety of backgrounds and occupations. What they have in common is that they all love writing and sharing what they’ve written.